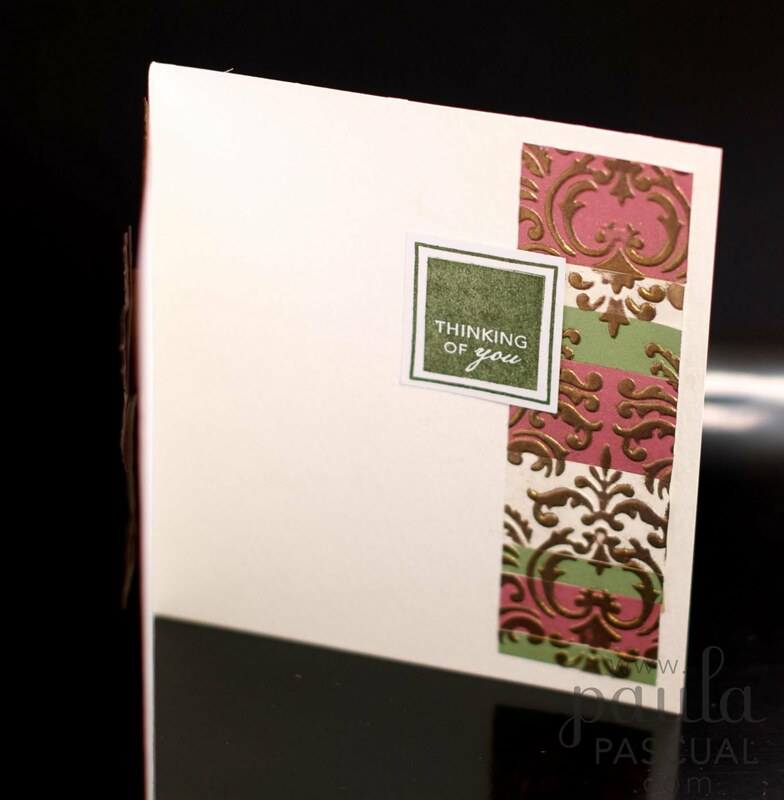 Does anyone remember crafting days pre embossing folders? I know that as a die cut fan makes sense that I find them one of my essentials of my crafting, but I am sure than most cardmakers will agree with me that they were an important addition to the paper crafting industry. When I am asked to do a die cutting class or demo, I am always delighted to do so and the first thing I choose for the samples are of course embossing folders. A close up to show up the shimmer from the mica powders. In this case I think I used Perfect Gold Pearl. As you can see I have used once again my patchwork technique. I am sorry if I am boring you with cards that showcase once again the same technique. However, I like to share cards that I have done recently that I like -yes, I don't like all of my cards!-, but more importantly, I think that cards using the same technique that have different looks and colors is more inspiring. The inside features a panel that actually was itself a leftover from the front. Yesterday I had a blast at Crafability, Vanessa Noonan's shop. The ladies were all a delight to work with and everything went smoothly. A bit manic, of course as all my classes tend to be as I am the kind of teacher that always prefers to give to much than too little. Gorgeous card Paula. How do you do the patchwork technique? All your cards are pieces of art so never get bored looking. I love everything about this card. Just gorgeous and very elegant and expensive looking.